I created this Golden Season pattern to share with you the joy of embroidery and making art. This is a intermediate level embroidery pattern which includes simple stitch, french knots and back stitch and also beads! To stitch this pattern would be easier if you already do embroidery and know how to do these stitches also adding your own style! *This is a digital item. What digital items are included? - 1 PDF file which includes A PDF guide step-by-step with photos on how to embroider the "Golden Season" with all the instructions by Katy Biele and the print out design. 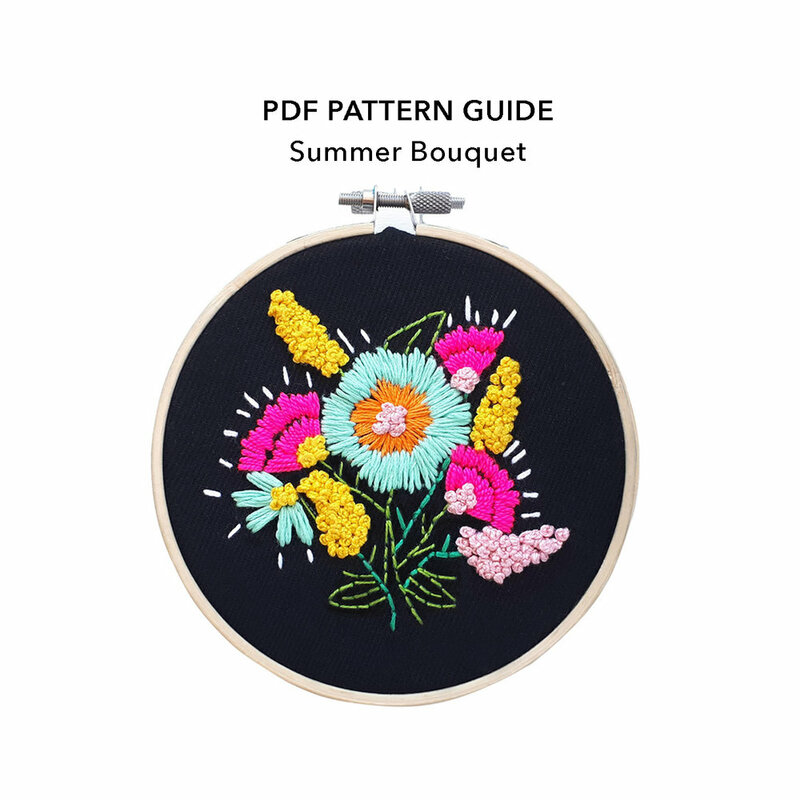 INTERMEDIATE LEVEL PDF pattern guide Summer Bouquet. I created this Summer Bouquet pattern to share with you the joy of embroidery and making art. This is a intermediate level embroidery pattern which includes simple stitch, french knots and back stitch. To stitch this pattern would be easier if you already do embroidery and know how to do these stitches also adding your own style! This pattern can be done in white or black fabric! - 3 PDF files which includes A PDF guide step-by-step with photos on how to embroider the "Summer Bouquet" on black or white fabric, with all the instructions and the print out design.